Mini books are so much fun to make! They are a wonderful means of self expression and a creative outlet. 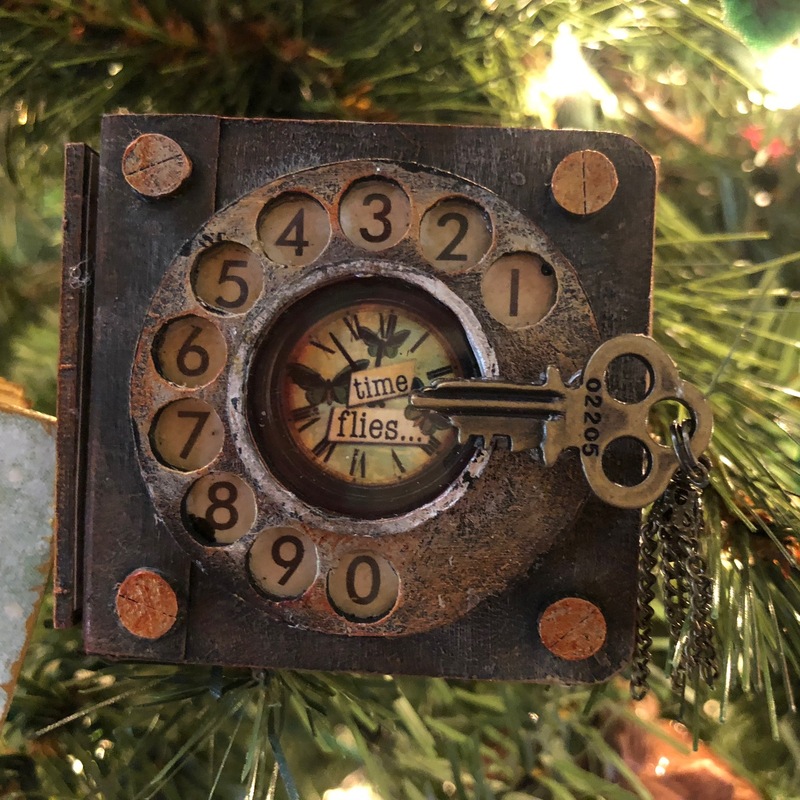 Whether you fill the pages with ephemera or leave them blank for journaling, they make great little one of a kind gifts made with love. With the holiday season fast approaching, you might want to add these mini books to your "wish list". They are from Tando Creative and FIVE come in one kit! Here are two mini books that I have created using Tando Creative's Mini Book Kit. Blank on the inside; I went from one extreme to the other on my covers. Let's get into the "how to's" of creating these little books and then you can let your imagination run wild! The same basic instructions were used in creating both basic books. For the more industrial book, I began with parts of three other kits from Tando Creative besides the Mini Book Kit. 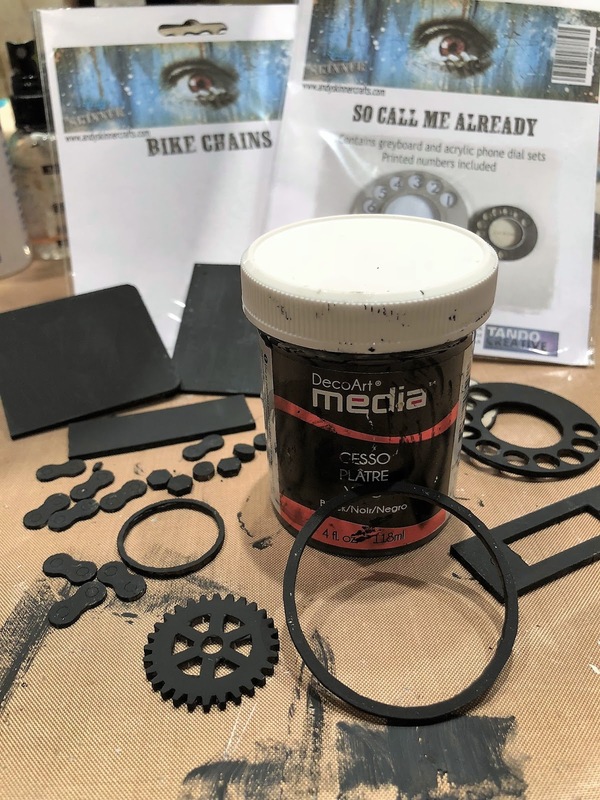 I used Andy Skinner's Bike Chains, So Call Me Already and various gears from his Industrial Elements kits. I LOVE all of these!! They are made from greyboard and really take mixed media elements well. 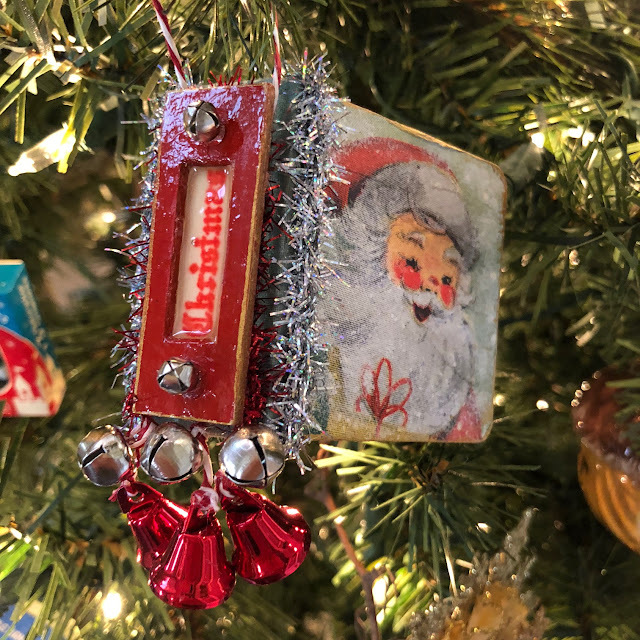 I painted everything with DecoArt Media Black Gesso. Next I glued all of the gears, screw tops and bike chain pieces to the cover. The dial and book plate will be the front cover but there will be paper added under them so they cannot be glued on yet. I put the book together using 1/2" black ribbon on the interior of the cover and 1/2" black cardstock on the outside covers. I simply folded the ribbon and the cardstock in the center. I placed the "spine" of the book between the two covers and glued everything in place using Fabri-Tack Glue. It dries quickly and clear but most glues will work. Allow for the book covers to bend by gluing the ribbon and the cardstock down into the valley between the spine and covers and let dry. Work the covers to bend easily. 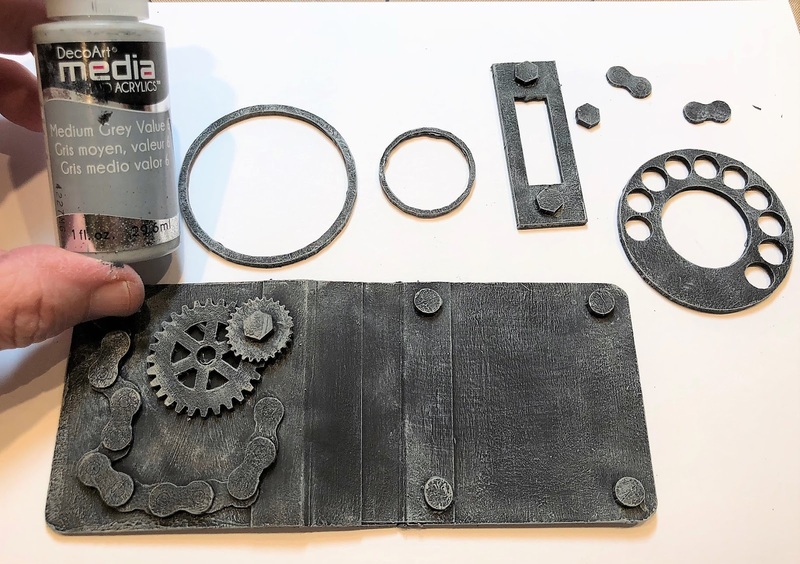 Next I dry brushed over the entire cover with DecoArt Media Medium Grey Volume 6. Just look how the black gesso becomes this lovely textural grey that really shows the detail of the cover so far! Now the REAL magic starts to happen! I dry brushed all of the elements and the covers with DecoArt Media Quinacridone Gold. Just look at the "rusty" goodness that continues to bring out the details! Bring on the metallics!! 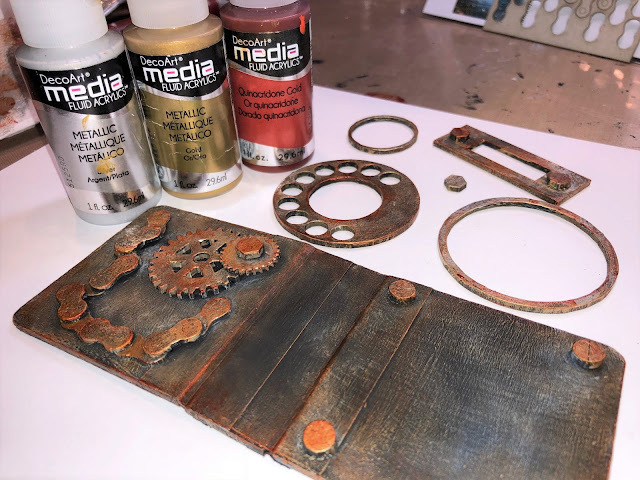 Using DecoArt Media Fluid Acrylics Metallic Silver followed by Metallic Gold and light touches of Quinacridone Gold here and there, the book cover now had a totally different look than when it started! 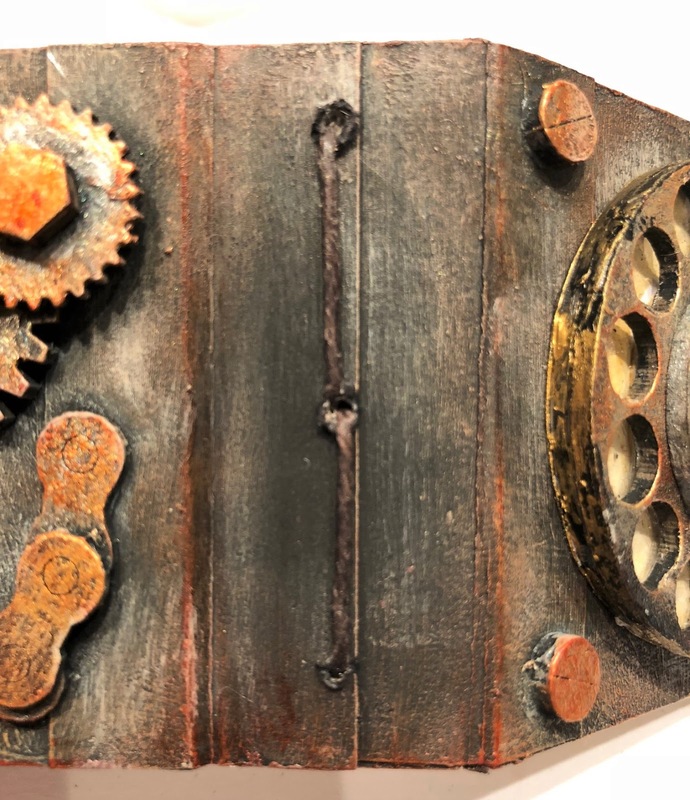 Now it's becoming very aged, and steampunk industrial! Now add the paper underneath the dial and then glue it in place on the front cover. 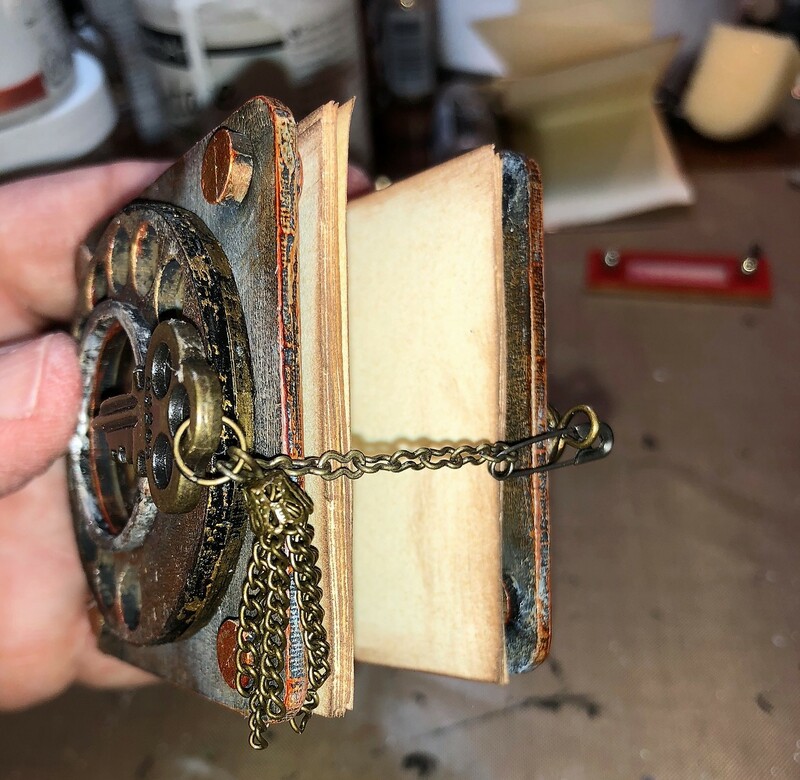 I also glued on a small metal key which not only adds some detail but will also be used to make a closure for the book. Next cut paper to fit inside of the mini book. My "pages" were cut 4 1/2" x 2". I edged the pages with a brown cats eye ink pad to make them look more work. I create one signature for this book. I punched three holes in the center of the spine. 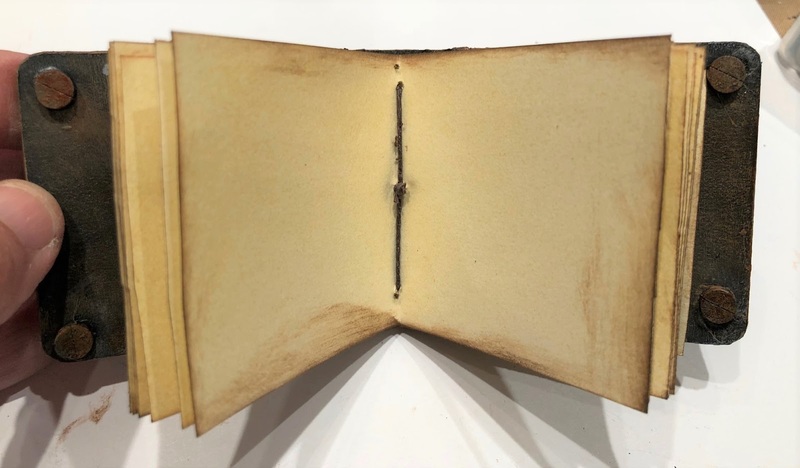 I used waxed linen thread to sew the signature in place: starting with the needle in the center hole pushing from inside to outside, leaving a "tail" of thread on the interior side of the book. Then I pushed the needle from the outside to the inside of the top hole. Then I pushed the needle through the bottom inside hole to the outside of the cover. Finally, I pushed the needle back through the center hole working from the outside to the inside of the book. Make sure that the thread is on either side of the thread the runs up the center of the signature and then tie it off in a square knot. Clip the edges. Here is what the outside spine of the book will look like at this point. You can leave it like this if you choose. 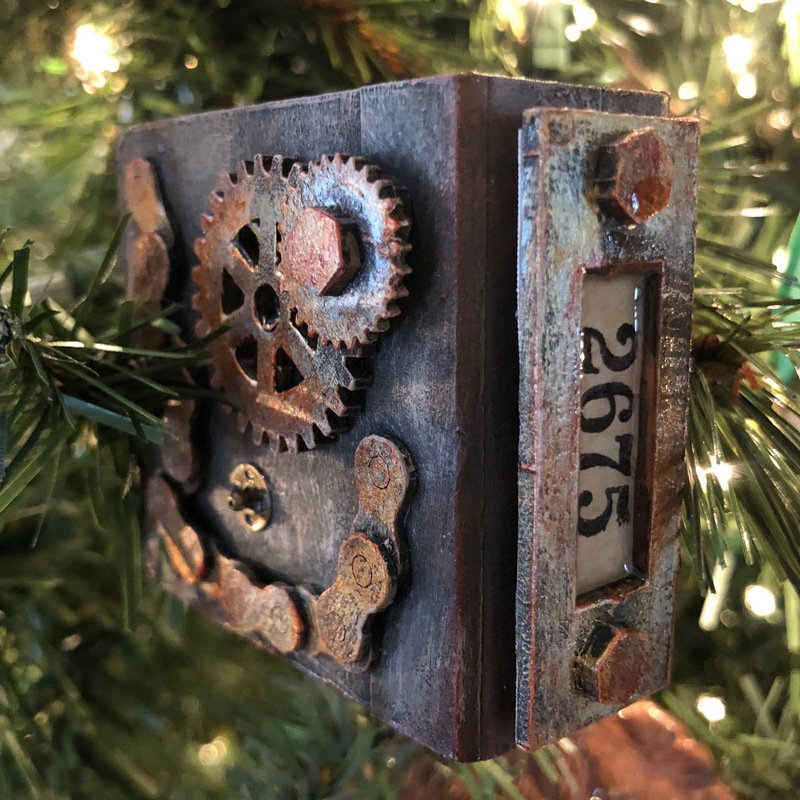 I added a book plate over it that has "2675" from Andy's Skuldoggery stamp set for added detail. I filled the section where the paper is with DecoArt's Media Fluid Acrylics Liquid Glass to make it look like a glass insert. 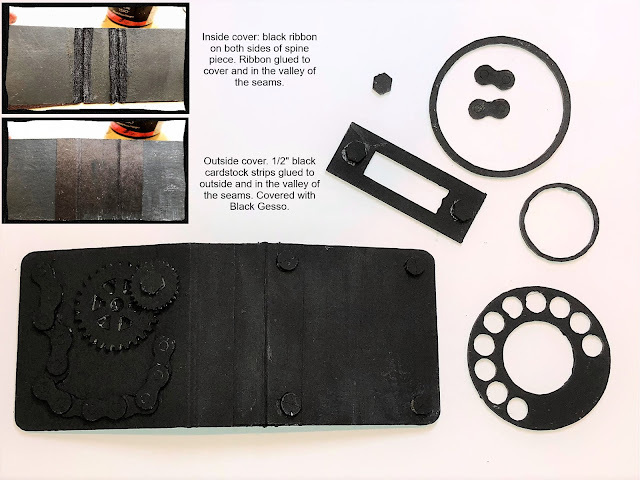 I added a bit of chain, a chain tassle, a metal loop on the back of the book and a safety pin to act as a closure for this little industrial style mini book. 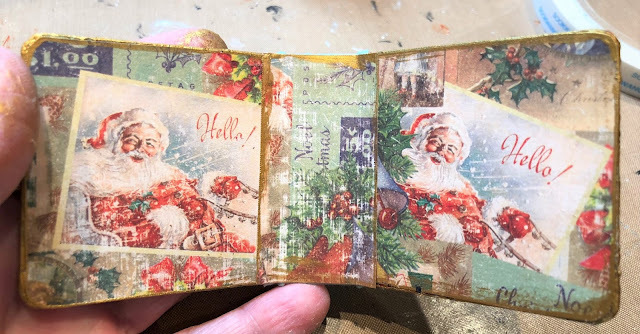 Here is a closeup of the finished front of the mini book. And here is a closeup of the back and spine of the mini book. Such fun and easy to do! 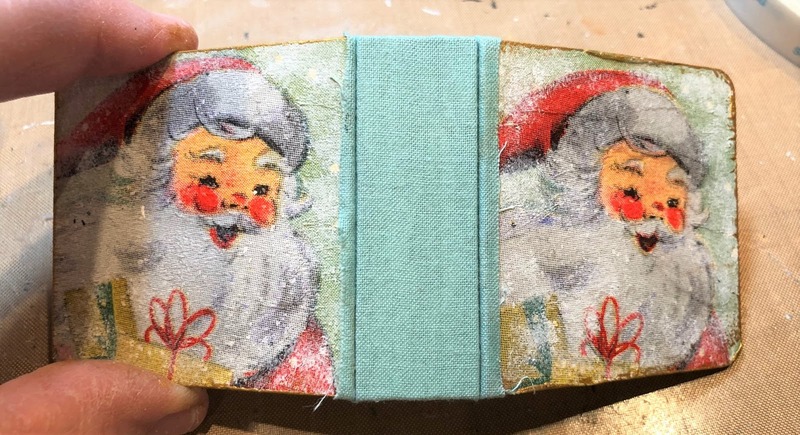 Instead of painting the covers with Black Gesso, I added cardstock to the interior of this little retro Christmas mini book. But the basic construction is pretty much the same idea. 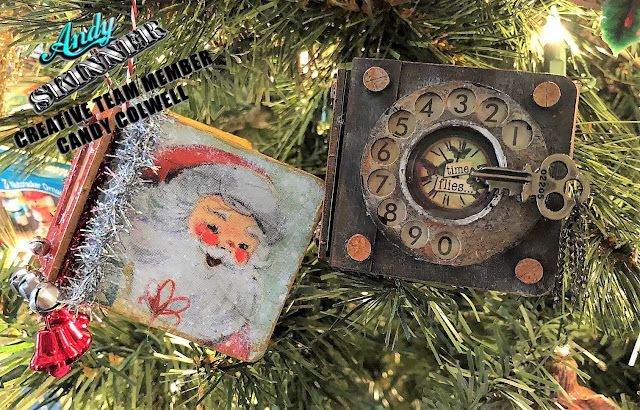 Here is the exterior cover of the Christmas book. I first painted them with DecoArt Media White Gesso, let it dry and sanded it. Then I used a Christmas napkin for the covers. 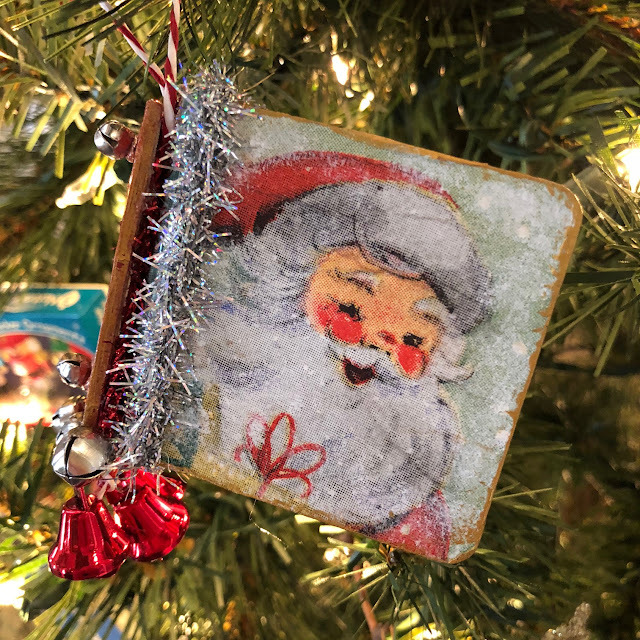 I glued them in place using DecoArt Media Matte Medium and worked out all of the wrinkles and bubbles with a brush. Then I brushed over the Santa image to seal it. 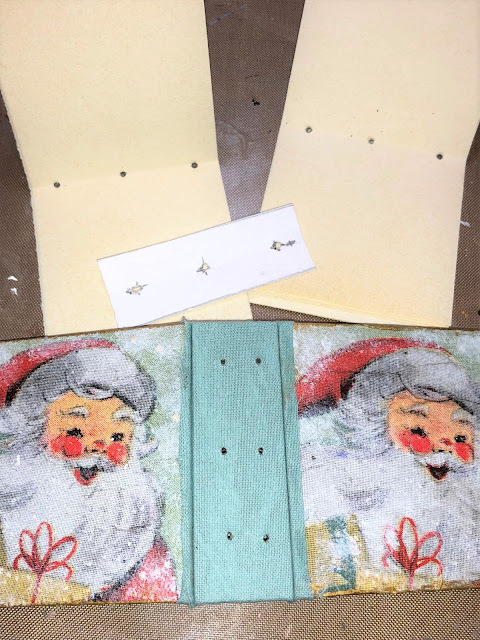 I lightly stippled some DecoArt Media White Gesso using a stencil brush around Santa's head. Then I added some DecoArt Media Fluid Acrylics Metallic Gold to the edges of the book using my finger. Next I laid the spine in between the two covers and glued fabric over the front side and down in the valley between the covers and the spine. On the backside, I simply glued on the cardstock center and down into the valley. Work the covers open and close freely. This time, I added two signatures with the same instructions as above. Here you can see the two sets of holes to sew your signatures through. Again, I covered the thread with a decorated book plate but if you choose, you can leave the spine looking just like this. 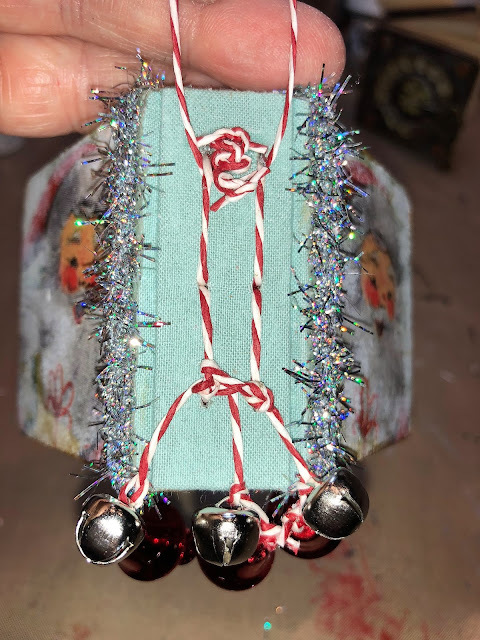 I tied jingle bells and little red bells to the spine threads for decoration and glued silver tinsel trim along the edge of the fabric to cover the raw edge. I added a loop at the top and am going to use this mini book as an ornament for my Christmas tree. Here is a closeup of the front. And here is a view showing the book plate on the spine. The center of the paper is filled with DecoArt Media Liquid Glass. 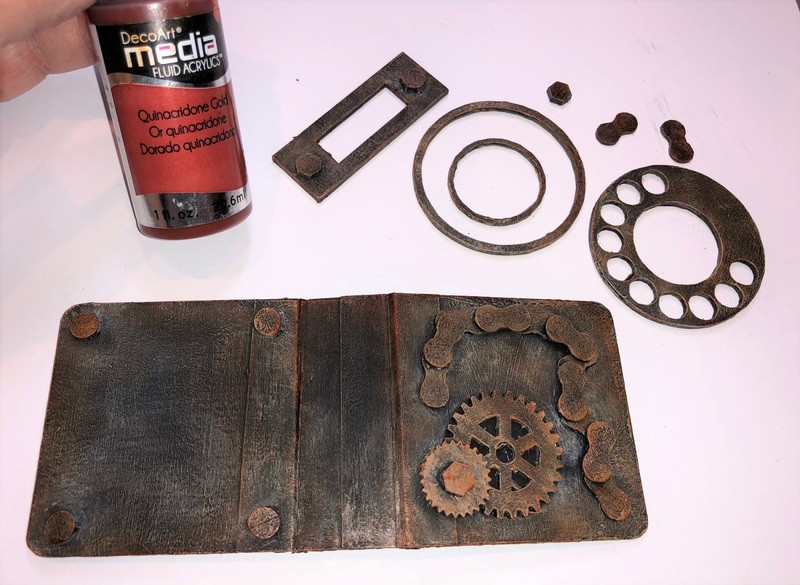 The same Tando Creative Mini Book kit but two completely different looks! Thanks so much for stopping by! I hope that these examples of mini books give you some ideas for creating your own little works of art! Thank you so much Brenda! You're always so sweet! I am so happy that I helped YOU get inspired on a mini book! Yours are always so fabulous! Annie...you are so sweet. Thank you so much. These are amazing, Candy! Love them!